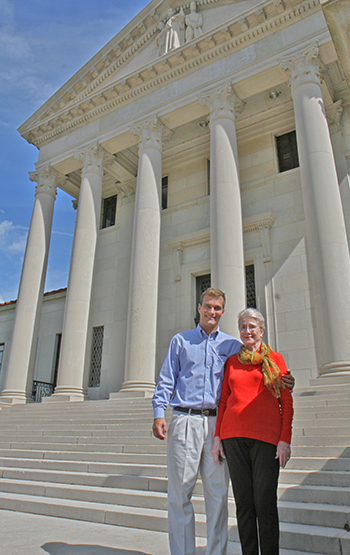 Hunter Odom stands with his grandmother, Pat Kleinpeter Odom, on the steps of the LSU Paul M. Hebert Law Center. Throughout his career as a lawyer, Huntington Odom had many successes. He was a partner at a Baton Rouge law firm, served as treasurer for the Louisiana State Law Institute, and was formative in shaping the state’s last constitutional revisions to benefit LSU. Huntington showed his lifelong appreciation for the LSU Paul M. Hebert Law Center by creating the James Huntington Odom and Patricia Kleinpeter Odom Professorship through a bequest in his will. Just as the endowed professorship will carry Huntington’s name for generations, generations of his family carry on his name—and legacy. James Huntington “Hunter” Odom III is currently in his first year at the law center.